HairPlanet Grade "AAAA" Nano Indian Remy human hair extensions are our Deluxe Volume range of single strand extensions. Each extension weighs 1g per strand of natual ratio hair, giving that extra thickness to create volumising and natural looks. Our 1g hair is packed in bundles of 25 strands and has an Italian Keratin Bond holding the nano tip in place. Approximately 75-100 strands are needed for a half head and 175-200 strands for a full head, this can vary depending on the style you are wanting to create and the thickness and density of the natural hair. 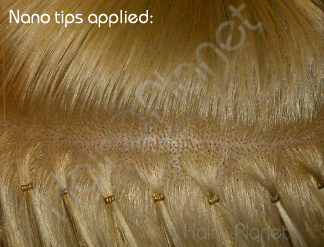 Nano tips are 90% less noticeable than traditional Micro Rings. Tipped with a high quality Italian keratin and a metal tip enabling the use of application using miniscule Nano rings. To apply these hair extensions you will need an EZ Threader, Nano Rings and an Extension Plier Tool which are available on the Hair Extensions Tools page. The image above shows the Nano Tip installed with the necessary Nano Rings, and for comparison, there is also an image of Stick tip installed with a Micro Ring, which shows the installation is very descrete when compared to it's predecessor. Please note: The Nano system is not suitable for every client as the rings are not as hardy as the standard 4mm rings or copper tubes due to their size. In some cases client may require more than one nano ring or even the upgrade to a silicone lined nano ring to secure the extension. If the client has extremely fine or oily hair we would advise the Nano tip to be removed and the bond applied using Copper Tubes or Micro Rings for added security if slippage persists. I am a hair extension specialist and have used different companies and different hair but HairPlanet are the best. They are the only company I will now use, the bonds are so strong and so small and subtle, a wide range of colours, and the hair providing the client looks after it properly can last in my own experience for nearly 2 years. The speed and accuracy of order delivery is fantastic. An extremely well organised and professional company and I would recommend HairPlanet to any fellow professional. Beautiful quality hair even with the lightest blonde shade I got. They also toned to grey very well! And best of all next day delivery for a great quality long lasting product. Brought two months ago and hair has been installed and maintained the whole time still as good as the day I installed them! Would buy again and will when I next need new ones. I am so happy with these extensions. Excellent quality and NO shedding! They keep their lovely shine and softness. I wanted to wait a few weeks before I left a review to see how they washed and wore but after a month they still look as good as the day I bought them. I won't hesitate to order again! AMAZING HAIR! My client was very very pleased!! Hair is amazing best place I've bought from thank you very much hope to do a lot of business with you. Hair is perfect match and looks the same as the picture, the hair is beautiful and soft, easy application on first go, just wanted these to thicken the front of my hair so I will be shopping again. These nano extensions are fab quality and very easy to apply and remove. Ive paid over £300 in the past for racoon and prostyles hair. It is still nowhere near as superior as HairPlanets Grade AAAA. Hairdressers in salons ask me where i bought from as they find it so luxurious to work with! Never frizzes, knots or goes dry. I am blonde and still get a shine off mine after a salon blowdry!!! Great service, items dispatched quickly and hair is fantastic! I will never go back to micro's!!!!!! Would advise to use silicone lined nano rings. These may be difficult and time consuming to fit, but the reward is THE best hair extensions you have ever seen! I have been an extensionist for 13 years now, I like to offer my clients an affordable service with a price range to suit everyone. I have tried every possible supplier of pre bonded and stick tip hair and your hair is by far the best quality I have used in a long time and your aftercare range is amazing, customer service is second to none, and always an amazing delivery service. I have been buying hair all this site for about a year now and been over the moon ever time. I love extension, I have used the micro loop, weft with tape in etc and every one is excellent quality. By far the best hair I have bought! Won't use any other company. Plus their customer service department is excellent, always answered my emails and when I ordered the wrong hair colour, no hassle and return it and got a refund the day they received the hair!!! Couldn't recommend this site enough!!!! Thanks so much!!! !